Hey everyone and happy Friday! Congrats on making it to the end of the week. I am SO excited for today's post, which is a city guide for Cincinnati! I visited last weekend and had an incredible time so I wanted to round up my favorite spots in case any of you are planning a trip there. I've gotten to visit a lot of U.S. cities this past year and Cincy was definitely one of the coolest ones I've gotten to see. It felt like a place where you'd move to start your own company or something, and I have a feeling in a few years it will surpass San Francisco in terms of the number of young and ambitious people with big ideas, because this feels like a city where you can make things happen. I liked that Cincy isn't too big geographically and you can get pretty much anywhere in 15 minutes. This place is practically bursting when it comes to culture—every art exhibition I saw and food that I tried impressed me. Plus, it's so accessible from lots of East Coast cities like New York, Philly, Boston, and D.C. It was an hour and a half flight for me from LaGuardia, and as you may know from people tweeting about the MTA, sometimes it takes me longer than that to get into Manhattan. So if you've been looking for a new city to check out that isn't too far and won't completely drain your bank account, you HAVE to put Cincinnati on your list. It's the perfect place to spend a weekend—I flew in Friday afternoon and flew back Sunday afternoon and still managed to pack in a ton of stuff. So, let's jump right into my favorite things that I saw/did/ate! Salazar—As in the restaurant with the most amazing appetizers I've ever had. Actually, we ordered three and barely had room for our main courses. Salazar delivered on nibbles like a fried oyster sandwich, and toasted breads with bone marrow butter as well as one of the juiciest burgers I've ever tasted. This contemporary American eatery is definitely worth checking out. Buzzed Bull—This boozy ice cream shop takes things to the next level. Here in New York, I had only experienced Tipsy Scoop, which makes pre-mixed flavors. At Buzzed Bull, you can pick your ice cream flavor, pick your booze, and pick your mix-ins. I mixed cake batter ice cream with vanilla vodka and rainbow sprinkles. Unreal. Taste of Belgium—I have never been to Belgium but I know that Belgium would be proud if they got to check out this Cincinnati gem. The dish that Taste of Belgium made at the Food & Wine Classic was my favorite dish of the night, and I even stopped by them at Findlay Market on Sunday morning to get a waffle with Nutella and bananas. Rhinegeist Brewery—As in the literal perfect place to spend a Saturday afternoon. Rhinegeist, which translates to "Ghost of the Rhine" is famous for its Truth IPA, one of the original recipes that its founders created, and today is one of the largest in the region. The building dates back to before prohibition and contains corn hole, ping-pong, and lots of tables for sitting, sipping, and enjoying. The Video Archive—When Destinee insisted on stopping by The Video Archive, I was trying to figure out what the big deal was and kept thinking I was in an episode of Dawson's Creek. We were told to search for a certain movie and when I reached for it, I opened a secret door to a Quintin Tarentino-themed speakeasy. It does not get any cooler than that, don't @ me. Mecca—If this bar existed in Brooklyn, I'd go there every weekend. It's true that Mecca does have some Williamsburg vibes, and it's in the Over-the-Rhine neighborhood, which gives it trendy clout. From locally-brewed beer to shots of absinthe, you can sip on whatever you'd like under twinkle lights as you try to squeeze as many friends as possible in at your picnic table. Top of the Park—If the view doesn't knock your socks off, the Rooftop Lemonade sure will. 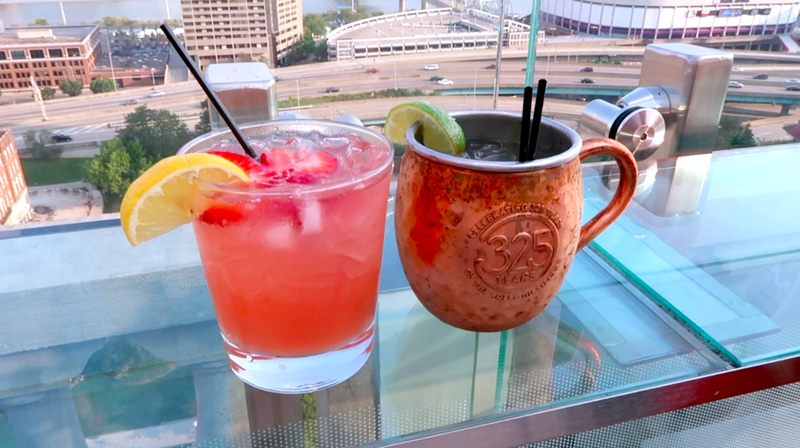 The Top of the Park bar at the downtown Mariott boasts beautiful views of both the city and the Ohio River. It's the perfect place to toast a special occasion, like, you know, visiting Cincinnati. Continuum Bazaar—There's something about this place that just makes me want...everything. The unique designers they sell and the brightly-lit storefront just make this place inviting. Continuum has a spectrum of stuff from quirky purses to velvety throw pillows. Idlewild Woman—This is a boutique that requires a stop-in. Browse the selection of lingerie and stackable rings, take a selfie in the gilded mirror, and take a whiff of the scented candles they sell. I wish that Idlewild Woman existed in NYC. Brush Factory—After getting a peek inside Brush Factory's design studio in Camp Washington, getting to pop into the store was a treat to see how pieces come together. The designers create custom furniture whether your interiors style is more traditional or modern, and the hand-crafted details make these pieces stand out. Deerhaus Decor—I honestly didn't want to leave this shop after spending all of 10 seconds in there. From baby succulents, to a matcha coffee table book, to beautiful notecards, this place is a Pinterest-worthy dream come true. Even after a lap around the store, I discovered new little gems the second time around too. Deerhaus Decor, you have my heart. American Sign Museum—Earlier this year I went to Las Vegas and got to tour the Neon Museum, and someone on the trip mentioned that there was a similar museum in Cincy, so guess what I was dying to check out on this trip. The American Sign Museum is one of the coolest places I've ever been. It documents neon signs from the last century and is organized by decade and by theme. My favorite part is a room in the museum called "Main Street" where you can see the signs in context of what they would have looked like in replicated store fronts. They even have cobblestones and fire hydrants to make you feel like you're actually walking down the street. Cincinnati Contemporary Arts Center—Right in the heart of downtown Cincy, this gorgeous multi-level building houses some of the coolest contemporary art in the game. We were able to attend the opening of an exhibition by the street artist Swoon, and to see her work in person was awesome. The Contemporary Arts Center knows how to put on a show, so definitely make sure you add it to your to-do list. Cincinnati Art Museum—We only popped in here for about 30 minutes but they definitely had some stellar shows going on at the time of my visit—William Kentridge's "More Sweetly Play The Dance" and Anila Quayyum Agha's "All The Flowers Are For Me" were the standouts. Oh, and the Cincinnati Art Museum is free, so there's no reason not to go. Eden Park—This is one of the biggest parks in Cincy and there's so much to do! There's the Krohn Conservatory, the Cincinnati Art Museum, and tons of scenic trails for running, biking, or just taking a stroll. The view of the Ohio River from the overlook is amazing, so definitely check out all that Eden Park has to offer. Findlay Market—Right in the heart of OTR (am I a local yet??) Findlay Market is the place to be. There are tons of vendors and you can get everything here from groceries, to pottery, to jewelry. Its nestled between some of the cutest pastel buildings. I can pretty much guarantee if I lived in Cincy, this is where you'd find me every Sunday morning. Sawyer Point Park—This park runs right along the Ohio River and is a great place to sit with friends and watch the sunset. Sawyer Point Park was where the Food & Wine Classic was held this year and it was absolutely gorgeous to walk around on a warm September evening. If you'd like to see which of these things I did on each day, check out my vlog below! And there you go! Have you ever been to Cincinnati? If you haven't...what are you waiting for? *MAJOR shoutout to Destinee, Lauren, Kim, and Tonya for making this trip so awesome! !